Makes the skin stronger, elastic and radiant. 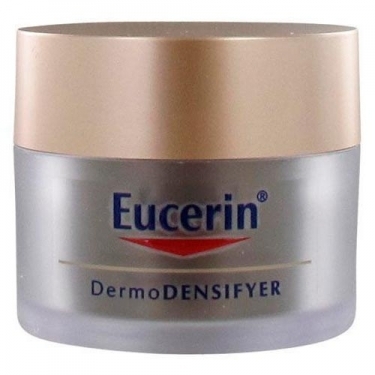 DESCRIPTION: Dermo Densifyer Night Cream from Eucerin is a nourishing night cream that improves nighttime skin regeneration and strengthens its structure. For a dense, elastic and radiant skin. It combines the natural ingredients Arctiina and Apiaceae Peptides to reactivate and accelerate the production of collagen so as to make the skin stronger, more elastic and radiant. The thin, brittle collagen is restructured into a denser, stronger mesh, while the junction between the epidermis and the dermis is enhanced to enhance skin microcirculation. The concentration of Dextapantenol helps the nightly process of skin regeneration for a total improvement upon waking. Avoid the delicate eye contour area.